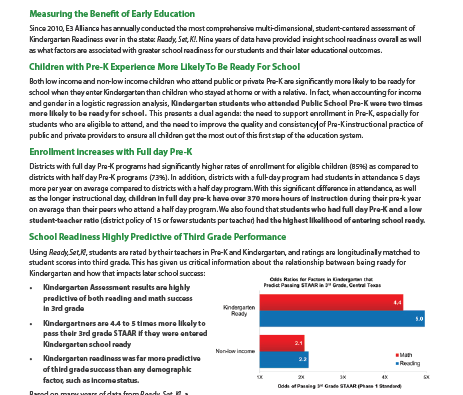 This document is a summary of three recent studies conducted by E3 Alliance and funded by the Michael and Susan Dell Foundation with support from KLE Foundation. These reports examined high school, postsecondary, and labor market outcomes for three cohorts of Central Texas students from traditional and charter public schools in the five county MSA who entered ninth grade between 2005 and 2007. The first report, “Does High School Matter? An Analysis of Secondary Outcomes for a Cohort of Ninth Graders,” and the second report, “Who Graduates from College? An Analysis of Which High School Graduates Succeed in Higher Education,” examined the high school, postsecondary enrollment, and postsecondary degree attainment of the three cohorts, and in particular, what factors helped or hindered low income and other traditionally underrepresented students. The third report, “Who is Prepared for Future Jobs? Postsecondary and Career Outcomes for a Cohort of Ninth Graders,” provided a deeper analysis of the education and labor market outcomes of the cohort that entered ninth grade in 2005. In this summary, three main types of outcomes will be summarized: high school graduation, postsecondary enrollment and graduation, and labor market status. Click here to view.